Who is funding anti-fluoridation High Court action? I strongly suspect a number of organisations listed in the register of New Zealand charities just shouldn’t be there. The Department of Internal Affairs provides facilities to search the charities register – it is worth doing if you have your suspicions. Why is this important? Well, registration as a charity provides tax-free status to an organisation. In effect this means all taxpayers are subsidising their activities. While most of us are probably happy to subsidise genuine charities it goes against the grain when they are not genuine. 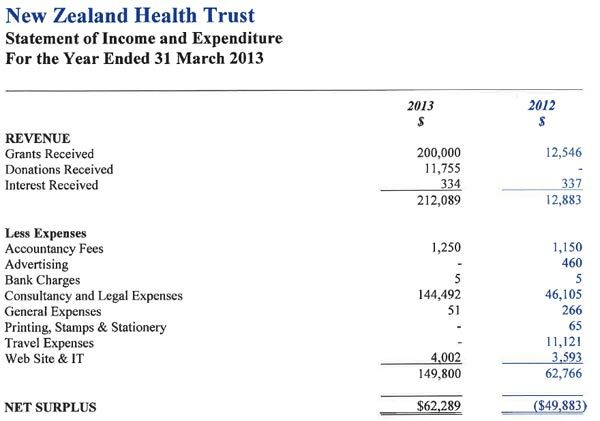 Here I will look at just one suspicious organisation – the New Zealand Health Trust. This trust is in the news lately because last November it took a High Court case against the South Taranaki District Council aiming for a judicial review over a decision to fluoridate water supplies in Patea and Waverley (see Chch group tests fluoridation push and Taranaki fluoride ruling ends up in court). [See Update below.] Such legal action is not cheap yet the New Zealand Health Trust is a registered charity so tax exempt. We are affectively subsidising the legal action – like it or not. So, New Zealand taxpayers are subsiding an industry lobby group, with commercial interests and aims. Inclusion of words like “health,” “natural” and “alternative” does not make it any different to any industry lobby group with commercial interests. Yes – as taxpayers we are subsidising political activity on chemtrials, way-out medical procedures and a lot else. We are subsiding opposition to vaccines, genetic modification and aspartine. We are also subsidising their expensive legal action to fight fluoridation. Registration as a charity requires annual financial returns and these are available on the register – from 2008 – 2013 for the New Zealand Health Trust. I don’t have the financial literacy to understand these returns completely but details of their main sources of income and main expenses for each year are interesting. Here is a page from their 2013 return. Their main income was not from donations (sort of expect that with a charity) but from undefined “grants.” And their main expense was not the education, research or relief of poverty talked about in their deed document but “consultancy and legal expenses.” Nowhere in any of the returns could I see any expenses related to research, education or relief of poverty. 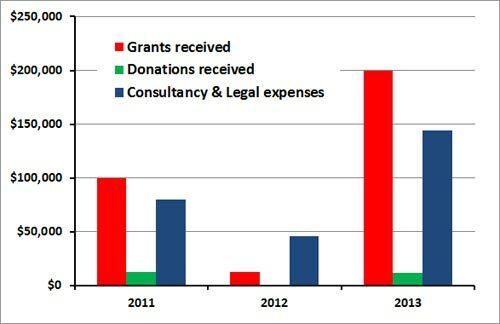 The plot below shows a lot of variability year to year in the size of the “grants” received and in their “consultancy and legal expenses” – completely consistent with their main purpose of lobbying on specific political issues and, for 2013 (and presumably 2014) the High Court case in South Taranaki. Unfortunately the financial returns don’t show that detail but the round numbers of 2011 and 2013 suggest single sources – and wealthy ones. (There was also a grant in 2010 of $534,521 which appeared to largely wipe out loans from a single person, P. D. Sloan, in earlier years.) Call me cynical but these “grants” look very much like payments from corporate companies for supporting their own commercial interests. Patrick David Sloan is listed as a director of several companies, including My Health Limited and NZ Essential Limited. A brief internet search showed Mr Sloan is director of a number of natural or alternative health companies. He has also been active in the anti-fluoridation movement – making a submission (all the way from Christchurch) to the Hamilton City Council fluoridation hearings (see Submission No: 1650 – Hamilton City Council). My conclusion is that the trust is being financed by levys or contributions from the industry as a whole or individual companies in the alternative health industry. From the complex web of links between the directors and companies that I looked at briefly it could be that grants are made from just one or a few larger companies in behalf of the industry. Incidentally, my interaction with anti-fluoridation activists and spokespersons also suggests a high proportion of people who work in this industry. Especially alternative health practitioners. In recent years the Charities Commission and the Department of Internal Affairs have taken steps to clean up the register. A number of “charities” have been removed because they do not satisfy the criteria. I suggest that the New Zealand Health Trust should also be considered for removal. I am sure that this Trust is not the only organisation getting tax exemption unfairly. Any organisation doing this should be exposed. This is not a judgment on an organisations aims – just that they should not have their work subsidised by the taxpayer if their aims are not genuinely charitable. Perhaps more seriously, the presence of such commercial and political organisations on the New Zealand Charities Register brings the area of charities into disrepute. “New Health NZ Incorporated has been formed by the NZ Health Trust because our supporters can’t become members of a Trust. New Health allows you to join up and show your support for the work of the NZ Health Trust in a way that costs you nothing, and imposes no obligation on you. You can find details of this body on the Register of Incorporated Societies at the Companies Office. Their recent financial returns show no income and a net debt – they will obviously not be financing any legal action. This entry was posted in Health and Medicine, New Zealand, politics, SciBlogs, science, Science and Society and tagged fluoridation, fluoride, High Court, New Zealand Health Trust, SciBlogs. Bookmark the permalink. That is an excellent piece of detective work, Ken! Huge change in travel expenses 2012-2013, eleven grand one year to zero the next. I can’t see anything coming from FANNZ – more going to them. Although probably not in a way that shows up in the finances. The fact that FANNZ has many people from the alternative health industry and certainly has that ideological orientation probably means that they are a useful propaganda wing but not a source of funds. As an incorporated society one can actually get a look at the FANNZ finances and I think they are pretty small bikkies. In the US, the society of Science in Medicine is being formed and there is a membership fee involved. I wonder if something similar could be set up here in New Zealand or Australia. There’s already Friends of Science in Medicine in Australia (http://www.scienceinmedicine.org.au/), and we had the founder, Loretta Marron, talk at the Skeptics Conference last year. Maybe an NZ branch of FSM (an unfortunate acronym!) could be setup? Speaking of scumbags hiding behind front organisations, my fears regarding the integrity of climate cranks who took NIWA to court appear to have been accurate. Pack of cynical bastards. Just what many people expected but still surprising to see it happen. Look forward to the liquidator’s report this week. Hope it get plenty of press coverage. If NIWA decides not to pursue Dunleavy, Leyland and Brill for restitution of its legal costs, then the NZ taxpayer will have to pick up the bill. Why don’t you do some REAL UNBIASED INVESTIGATIVE research into how much TAX PAYERS MONEY is been SQUANDERED by the MINISTRY of HEALTH & each of it’s DHB’s? & who of it’s EMPLOYEES & PARLIAMENTARIANS both past & present have a financial interest in the services & products that are supplied to & SUBSIDISED by US the TAXPAYERS?! Sue, let me put that back on you – why don’t you do some unbiased investigation into this fiel?. I am sure there is plenty of scope to find cases of exploitation of the public sector by private companies and practioners. And the research results will be useful. In this case I have concentrated on just one example of an organisation which is ripping off taxpayers by getting tax exemption it should not be. A particular interest of mine. I take it that you actually have no disagreement with either my analysis or conclusions as you made no specific criticisms. I think NZ is the only country that allows TV commercials for prescription drugs. These drugs are funded by the taxpayer. They actually say “fully funded” on the ads. Sadly, Sue, your allcaps button seems to be partly broken. For real legitimacy on the internet, it’s got to be all in allcaps. See? Less that 50% was in allcaps. let’s correct that. Yet by adding more allcaps, now your missive looks far more sane and rational. It virtually reeks of seriousiness and truthy. Of course, for that extra dash of gravitas, one more thing could be added. Speaking of “Alternative Medicine” underwriting the anti-fluoride campaign, I noticed in yesterday’s South Taranaki Star, a guy called Bill Hazeldine wrote a krazy Krazy letter comparing fluoride to a “war crime” and suggesting that the local body is lacing drinking water with a banned chemical weapon. A search of linkedin reveals a “Bill Hazeldine” is an “Owner” of an alternative medicine business, Neways International, located in the Bay of Plenty…the same person…?? I doubt the “owner” but maybe a distributor…? Mark, I am a member of the Australian friends of science in medicine. But unfortunately, fluoride isn’t on their books right now. They are too busy hunting down the anti vaccers etc. although I think we all know that the anti F brigade are generally a sub species of the crystal gazing, alt health mvt. Actually, the more educated group is the anti=fluoride group because they at least know the difference between SODIUM fluoride and the acid fluoride that is put into the water (which is fertilizer waste) – 2 completely different animals that the PRO – lobby can’t seem to figure out. Ian, care to explain what the “acid fluoride” you refer to is? And what the relevance of your unwarranted claim is to the subject of this article – the industry funding of the anti-fluoride high court action? I personally have found an appalling ignorance of the chemistry involved in fluoridation amongst the anti-fluoride activists. We are dealing with morons here.